This may seem silly stuff to many of you readers and it would be if it weren't for the fact that so many people take these publications seriously. Chick's business has thrived for decades and his tracts are available in 100 different languages. Chick has distributors in England, South Africa, Australia, New Zealand, Canada, and Germany. Police officers have used these tracts as a resource. 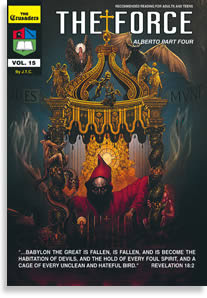 For example: The comic The Force was used as the basis for a history of Satanism presented by Detective Eisenbraun of the Rapid City Police Department in his presentation on Satanic Crime in Bismarck, North Dakota in 1989. As it happens, The Force takes us right to the heart of the matter. It was a Freemason symbol! That's because in the late Alberto Rivera's conspiracy theory, the Catholic church controls not only the Freemasons, but communists, Jews and atheists all over the world, and, by the way, created Islam in order to destroy Jews and Protestants. What does Jack Chick think about this? It's hard to find out, because he has made it a policy not to speak with reporters. But when he was finally reached by phone at his home, he said that he had never met a more godly man than Alberto, and that he knows Alberto's story is true because he ,.prayed about it." Jack says he expects his own life to be taken by Jesuit assassins. Chick is a Protestant fundamentalist. Fundamentalism is a name the movement has given itself, because it supposedly defends the fundaments of Christianity. Like all Protestant movements, they consider themselves more Biblical than the others (and certainly more Biblical than the Pope! ), and almost all fundamentalists profess a belief in Biblical inerrancy. The latter is the idea that the Bible is completely and entirely true; a position held by, for instance, Republican presidential candidate candidate Rick Perry. He also believes the Authorized King James Version of the Bible to be the only true word of god. Now, I take an almost macabre interest in the Biblical exegesis of fundamentalist Christians, because I'm somewhat interested in the Bible as a text, and because it's entertaining that they paint themselves as "Biblical". Most of all, though, the notion of someone claiming the Bible to be "infallible", or that they believe it "literally", is just too hysterical to pass up. So now our blog has a "Bible" label. Yeah, thanks, "ex-Jesuit priest" Alberto. Presumably, this is some of the "information" provided by Alberto, as I've been unable to find a single non-Chick source for this notion that a Catholic conspiracy murdered any of the King James Bible translators. Alberto seems to just, I don't know, make stuff up. So according to Jack Chick, the Old Testament Apocrypha are a Satanic plot against Christianity. So, Jesus never quoted the Apocrypha, sez Chick. He didn't really quote any of the Old Testament books that much, but made frequent allusions to them. The trouble is, he also frequently alluded to the Apocrypha. Here's a few examples (from the King James Bible, naturally). Sirach 29: 11 Lay up thy treasure according to the commandments of the most High, and it shall bring thee more profit than gold. Matthew 7: 16 Ye shall know them by their fruits. Do men gather grapes of thorns, or figs of thistles? Sirach 27: 6 The fruit declareth if the tree have been dressed; so is the utterance of a conceit in the heart of man. There's several more direct allusions to the Book of the All-Virtuous Wisdom of Jesus ben Sira, which has the most awesome name of any Biblical book ever, including Jesus' parable of the seed falling on stony ground. Woe to the nations that rise up against my kindred! the Lord Almighty will take vengeance of them in the day of judgment, in putting fire and worms in their flesh; and they shall feel them, and weep for ever. 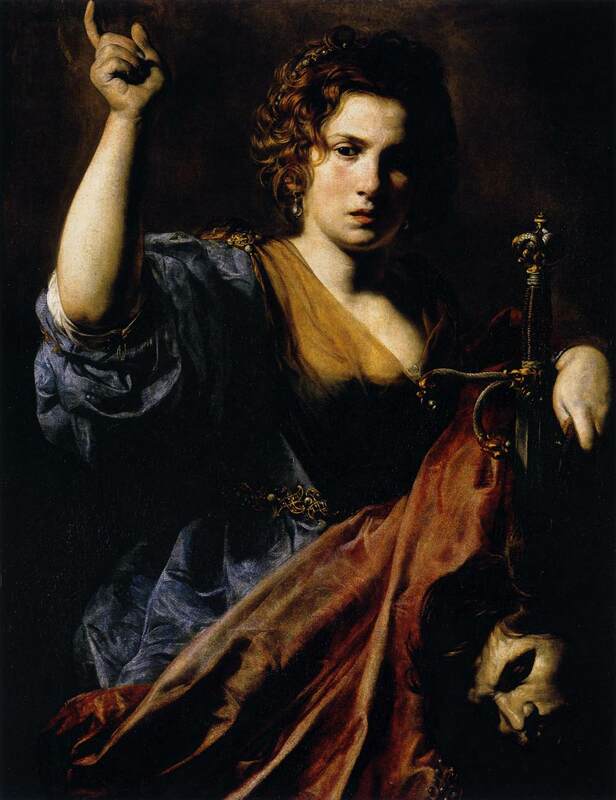 Even though it's slightly anticlimactic that the Book of Judith is just called the Book of Judith, it has inspired some great art, like Judith by Jan Sanders van Hemessen, which I was going to show here but got censored by Blogger, and the similarly named Judith, by Valentin de Boulogne. Dudes really liked painting her. Tobit 7: 18 Be of good comfort, my daughter; the Lord of heaven and earth give thee joy for this thy sorrow: be of good comfort, my daughter. The title "Lord of heaven and earth" also occurs in Luke 10:21 and Acts 17:24, but nowhere in the Old Testament. So the famous devotional song "How Can I Keep from Singing?" is an apocryphal reference. There's a whole bunch of allusions and references to the Apocrypha in the gospels, which isn't the least bit surprising, since the Greek Septuagint was the Bible used by the early Christians, and it included the Apocrypha. But I guess that in Jack Chick's books, the apostles weren't True Christians. And this is where things get confusing. When Chick, or whoever is actually responsible for this tract, talks about the "Alexandrian manuscripts", presumably he is referring to the Alexandrian text-type, which is one of the oldest surviving sources for the New Testament. However, he also mentions the Old Testament, which I suppose might mean he's talking about the Septuagint as well, which was created in Alexandria. So is he seriously saying that the Bible used by the apostles was a Satanic lie? Elsewhere, Chick offers a bizarre justification for these views by comparing the contexts in which Alexandria is mentioned to Antioch. Again with the "true Christians", this time with the bizarre idea that the Emperor Constantine was the pope (he wasn't), and the somewhat startling claim that the Vulgate is also "satanic". Once again we encounter the bizarre notion that the apostles and early Christians weren't "God's people", given that they were using a Bible based on the satanic Alexandrian manuscripts. I don't recall seeing this kind of pure hatred against the Apocrypha before. After all, in Protestant tradition, the Apocrypha were considered, as Martin Luther put it, not canonical but worth reading. I think one of the most vital clues is in the word "scholars" and the quotation marks around it. Belief in Biblical inerrancy and literalism is one of the foundations of Protestant Fundamentalism, and I imagine at least part of it comes from the fact that many fundamentalists aren't very well-read in Biblical scholarship and exegesis. Instead, they stubbornly insist that the Bible can be read "literally", a ludicrous idea, and I imagine they see Biblical scholars who debate the merits of different translations and the Apocrypha as suspicious intellectuals with edumacations. It's also been argued that the roots of Protestant fundamentalism are in Calvinism, which took a very dim view of the Apocrypha. Yeah. When the inquisitors come for you, they'll be using that law. As I understand it, the Synod of Toulouse in 1229 banned the owning of vernacular Bibles, but I'm not entirely sure about that one. What I am fairly sure about is that scholarly opinion considers the Textus Receptus to have been compiled from several Greek manuscripts by Erasmus of Rotterdam in 1516. All of his sources dated to the 12th century or later, and were mostly of the Byzantine text-type. As Wikipedia puts it, "most modern scholars consider his text to be of dubious quality". Certainly by the standards of modern exegesis, you'll have a hard time justifying the idea that the Textus Receptus is somehow more truly preserved than, say, the Alexandrian manuscripts. Today, this position is only held by Protestant fundamentalists who are completely opposed to any textual criticism of the Bible. Like Jack Chick! What's even funnier is that some of Chick's comrades on the evangelical right consider Christian humanism and Erasmus himself to be pretty much anti-Christian. While most Protestants regard Erasmus as one of the fathers of the Reformation, Protestant reformers see his "Christian humanism" as a plot of the Catholic church to destroy Christianity. In his documentary series How Should We Then Live?, Francis Schaeffer described Christian humanism as not Christian at all, and Rus Walton asks: "Is it not another snare, another delusion, another trap to draw man away from God?" Just in case you think these are some random crackpots, Republican presidential hopeful Michele Bachmann has described watching the Schaeffer films as "a life-altering experience". So while Jack Chick considers Erasmus to have been a divinely inspired hero who is faithfully preserving the true word of god against a grand Catholic conspiracy, to other Protestant fundamentalists, he's one of the chief agents of that selfsame world conspiracy. This is a wonderful example of what happens when you don't approach history on its own terms but as raw material for a conspiracy theory. When Schaeffer wants to prove that secularism is the greatest evil facing Christianity, he creates a monolithic "humanism" and projects it back into history. Of course, he also thinks the Catholic church is evil, so he tacks that on as well. Chick, on the other hand, wants to prove that the King James Bible is the direct word of Jesus, so he creates a pseudohistory of "inspired texts" leading up to it. Of course, he also thinks the Catholic church is the greatest evil facing Christianity, so he tacks on a monolithic conspiracy theory. The net result is that Erasmus of Rotterdam is either a tool of the Catholic world conspiracy, or a heroic Christian warrior fighting against it. I guess the lesson is that making actual history fit a lunatic conspiracy theory can be surprisingly hard. This notion, along with their casualty figure, is just pure nonsense. Certainly Erasmus was critical of the Catholic Church, even in the Textus Receptus itself, but the idea that the whole Inquisition was put together to weed out the Textus Receptus is ridiculous. The notion that the Textus has a different teaching on salvation from, say, the Vulgate, is also basically just made up. The words apparently crept into the Latin text of the New Testament during the Middle Ages, "[possibly] as one of those medieval glosses but were then written into the text itself by a careless copyist. Erasmus omitted them from his first edition; but when a storm of protest arose because the omission seemed to threaten the doctrine of the Trinity, he put them back in the third and later editions, whence they also came into the Textus Receptus, 'the received text'." The modern scholarly view is that the Comma Johanneum is a later addition, and Erasmus himself agreed. However, he re-inserted the passage after protests, and now Chick and other King James Only -fundamentalists insist that it is divinely inspired. The funniest part of all this is that Erasmus used the Vulgate Bible in creating the Textus. So even by Chick's standards, the Textus Receptus is satanic. The dodge they use to get out of this is to insist that the Textus Receptus itself was divinely inspired, as Chick indirectly says in this tract, and now we've firmly crossed over into cloud cuckoo land. It also, once again, begs the question of whether Erasmus was a divinely inspired Christian or an evil anti-Christian Catholic, but never mind. Why, exactly, would this be disastrous to the Catholic Church? The tract claims that the Textus Receptus teaches that salvation only comes from Jesus and not the Church, but as no evidence is offered for this position and I can't find any, we have to regard this as having been made up. In all probability, this is a Chick-Rivera fiction to make the Catholics look bad. I can't, for the life of me, understand what in the Old Testament apocrypha, which was included in the King James Bible, would make Protestants suddenly convert to Catholicism. To me, this is the biggest single mystery of this tract. How on earth would getting Protestants to accept the Apocrypha as canonical suddenly make them Catholics? All the reasons I've been able to find online for rejecting the Apocrypha are either totally spurious, like simply asserting that they're just not cricket, or criteria that could also be used to disqualify any books. For example, several instances accuse the Apocrypha of contradicting books in the Bible; well, the canonical books do that all the time as well. I genuinely don't understand why Chick's tract is so implacably hostile to the Apocrypha in the first place, let alone what sinister Catholic purpose they can possibly serve. Of course, this is followed by assertions that all subsequent Bible translations have been engineered by the Vatican because they're evil. The Puritans are prominently represented here because most American Protestant fundies consider themselves to be the spiritual descendants of Puritans. I'll have to talk about that at some point, but for now, let's just go on with the propaganda. Actually, it's these panels toward the end of the tract that bring us closer to understanding why this tract hates the Apocrypha so much. As we're once again joined by "Dr." Rivera, we can try to offer an answer to this implacable hostility toward newer Bible translations and the Apocrypha. All "Biblical literalists" profess a belief in a monolithic Bible that contains only one message; after all, if the Bible were to contradict itself or even be ambivalent about something, it couldn't be interpreted literally. Now, this kind of interpretation isn't actually possible, but it is possible to insist that it is. If the Bible is mostly read by uneducated people who don't know the first thing about history or exegesis, I suppose they can imagine that the Bible can be regarded as being literally true. The above panels make it pretty clear that this tract's hate is directed at exegetes who actually know about the Bible in its historical context and about textual criticism. After all, their knowledge threatens the whole notion of Biblical infallibility, by pointing out where the King James Bible contradicts itself, is flatly wrong about historical events or geography, and similar things. This, of course, is anathema to them, as is the general shift in opinion toward viewing the Bible as a historical text among texts. So what better way to banish these doubters than by implying that they're part of a Vatican-directed satanic conspiracy? The only thing I don't like about them is they sell foreign language versions of the KJB. I don't think that's right. We know the only true translation is the 1600's version in English. It's too risky for anybody to translate that into other languages. Mistakes can creep in... and that can lead to heresy. True Christians should only read English. To most people, that's pretty funny. However surprising it may seem after reading the above tract, Jack Chick is actually a fairly moderate King James Onlyist. He seems to belong to the "received text only" faction, who maintain that the Textus Receptus was divinely preserved to serve as the basis for the Dinsdale, erm, Tyndale Bible and the King James bible. Others, though, believe that the translation process that gave rise to the King James Bible was itself divinely inspired. Chick hints at that when he says God oversaw the process, but although he says the original authors of the Old and New Testament were divinely inspired, he doesn't extend the metaphor to cover the King James translators. There is yet another view, sometimes called Ruckmanism after its vocal exponent, Peter Ruckman, a Christian lunatic who believes the CIA is secretly breeding aliens in underground facilities. 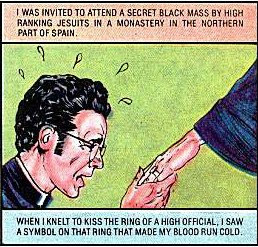 As Jack Chick predicted he would be assassinated by Jesuits, in 1997 Ruckman predicted the government would have him killed in the next few years because he knew about the brain transmitters they had implanted in African-Americans and all the other nefarious CIA plots he's invented. Of course, making predictions that fail to come about is very Christian. Intriguingly, Ruckman also seems to think that anti-abortion activists are Darwinists. Yes, you read that right. Ruckman believes that the King James Bible constitutes revelation in itself. He's said: "Mistakes in the A.V. 1611 are advanced revelation!" He considers that the King James Bible, as more recent divine revelation, is superior to any earlier manuscripts or translations. He attacks an "Alexandrian cult", which according to him believes that the original text of the Bible has been lost, and that therefore no final word of god exists on Earth. The Textus Receptus, on the other hand, he considers a separate text from the "Alexandrian cult" manuscripts, even going so far as to say that the Septuagint is a deliberate forgery created to discredit the Bible. Ruckman's views are so extreme that the majority of the King James Only movement is opposed to them, let alone other Christians. What's interesting here is that Chick's narrative parallels Ruckman's in many places. Chick's strange references to "Alexandrian manuscripts" now appear to be derived from Ruckman, as is the primacy of the Textus Receptus and its fictional history. On Chick's website, we can find a strong defense of Ruckmanism. However, in the tract, Chick doesn't quite go the whole hog. He replicates several parts of the Ruckman narrative, but portrays the Textus Receptus as the divinely protected original word of god, and doesn't claim divine inspiration, let alone revelation, for the actual translation process of the King James Bible. I imagine Chick has toned down the Ruckmanism to make his tract have a wider Christian appeal, but in doing that he's created numerous inconsistencies. In insisting that both the "Alexandrian manuscripts" and the Vulgate are satanic, but that the Textus Receptus is the "preserved" word of god, he's created a textual history that just doesn't add up. Of course, he may claim that the textual history of the Bible is all a Catholic lie. That's really a kind of "get out of jail free" card for conspiracy theories: if the history doesn't work out, just claim it's a conspiracy. Works for everything from ancient aliens to Bible translations. To end on a sobering note, this can all seem like the deranged fantasy of an almost 90-year-old man who publishes comic books on the Internet. But like I said earlier, the current governor of Texas, who is one of the front-runners for the Republican presidential nomination, actually believes that the Bible is infallible. So this isn't just a study in Internet lunacy, but in contemporary American politics. To recap, in this post we've seen that in the world of Jack Chick, only the Textus Receptus and the King James Bible are the word of god, and the "Alexandrian manuscripts" (possibly including the Septuagint) are satanic. The way these conclusions are reached tells us quite a lot about the theology of Jack Chick, and about his cavalier disregard for history and Bible exegesis, and his positively danbrownian dedication to simply making stuff up. Or, if you prefer, lying. All this will also have some interesting implications later on, when we continue our series of blogistic exegesis. Catholicism is from the pit of hell itself. Repent! You are the unwise, if you support Catholicism, and you cannot see, for you are blind. Actually, the "jot and tittle" quote (Matt. 5:18) refers to the Law, i.e. the Torah, not the Bible, and says nothing about inerrancy. In fact, theBible itself doesn't claim to be either inerrant or the direct word of God anywhere. So I find the notion of Biblical inerrancy to be ...unbiblical. 17 Think not that I am come to destroy the law, or the prophets: I am not come to destroy, but to fulfil.18 For verily I say unto you, Till heaven and earth pass, one jot or one tittle shall in no wise pass from the law, till all be fulfilled.19 Whosoever therefore shall break one of these least commandments, and shall teach men so, he shall be called the least in the kingdom of heaven: but whosoever shall do and teach them, the same shall be called great in the kingdom of heaven. Here Jesus is making it very clear that the whole Law, even the least of the commandments, must be obeyed. Yet in Mark 7:15-20, Jesus says that nothing that enters a man defiles him, so the dietary restrictions of the Torah no longer apply. Now, the King James Bible tries to get out of this by changing the text so that Jesus is only talking about washing your hands, but most other translations agree that what's at stake is the whole of the dietary laws, which most Christians to this day don't obey. If the Bible is inerrant, and Jesus says you must obey even the least of the commandments and says it's okay to not obey the commandments on food, which is it? This is far from the only example, but you mentioned Matthew 5:18 yourself.